In a 2003 interview, Jackie Winsor reminisced about New York City in the late 1960s: “The art world at the time was a tiny place. You could see every exhibition you wanted in about an hour and a half.” Although it smacks with a little nostalgia for simpler times in big New York, Winsor’s recollection seems to have its benefits. If everything is visible all at once, then there’s a shared vocabulary. To put this another way, in a smart animation by Rob Bryanton he illustrates how to conceive, in layman’s terms, of the tenth dimension. Starting simply, he depicts the second dimension as an ant walking on a flat newspaper, and then rolls up the paper so that the ant can walk across the entire rolled up surface, and that’s the third. In the Chicago dimension, we are a little bit Winsor and a little Bryanton. Loopholes through space and time are just small flourishes of the hand. In this case it’s easy to see Lucas Samaras’ arrangement of magic knives, on view at the MCA, through the collection of sacrificial knives of the Northwest Coast Indians, on view at the Field Museum—although these two sets of objects have never met. Some may call this small-world scenario a problem, or provincial; but I have experienced it as beneficial. Chances are that at any time in Chicago there are a handful of artists exhibiting in several venues concurrently. Such redundancies may make Chicago seem like a smaller cultural center than it is, yet I’ve seen this help artists, and help audiences better understand our artists. This past weekend Dana DeGiulio closed one exhibition in Garfield Park while the paint still dried in another in the South Loop (actually, the paint was also still drying, or oozing, in the first show). 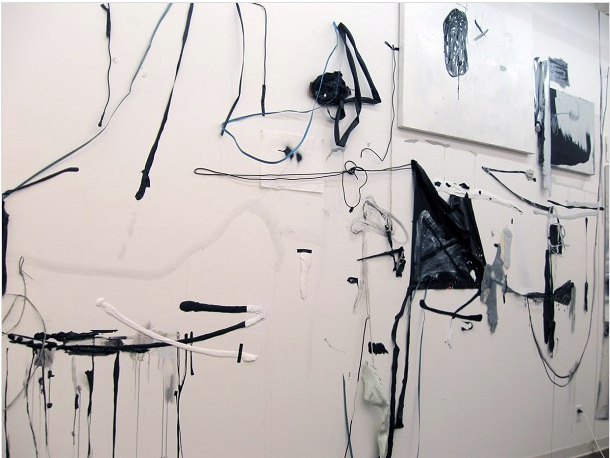 Both shows feature large-scale wall installations composed of a constellation of objects and materials: small drawings, abstract paintings, spray paint, rope, poured plastic, photocopies and cannibalizations from previous artworks. The overall effect is an explosion or conquering of the gallery wall. Though DeGiulio’s painted gestures are confident, these are only the first and second large-scale installations that she has made. They could mark a signature style for the artist, a mix of painting and sculpture through a gothic lens, but DeGiulio hesitates to corner herself. She “hopes not” to make something this big again, at least not soon. “Every moment is fraught with potential,” says DeGiulio. This could be true of both her small, charged abstract canvases and the expansive wall pieces. Each gesture bears the weight of everything, anything. Both of DeGiulio’s wall paintings are part of group exhibitions, meaning that the artist had to grapple with two frameworks larger than her own studio practice. Dan Devening, whose gallery consistently shows highly formal and designed art, often of a cool Germanic persuasion, presented DeGiulio’s recently closed exhibition. 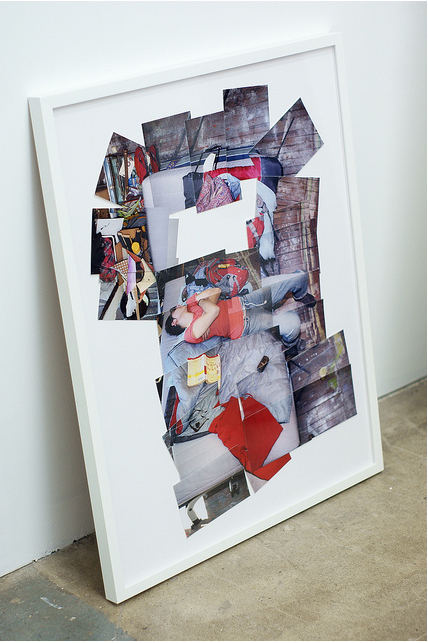 Her second wall installation is being shown in “Tomboy,” a curated show featuring the art of six lesbians whose work is tasked with representing contemporary queer identities. “Both are powerful contexts,” DeGiulio says. Does DeGiulio’s affiliation with “Tomboy” mean that all of her painted gestures are queer? Does her inclusion in Devening’s gender-neutral white-cube laboratory mean that she values the purity of her craft over any projected subject matter? Working towards both exhibitions was “challenging in ways I didn’t anticipate,” says DeGiulio. “Every move became debilitating, goofy, self-conscious,” she says of the “Tomboy” installation, which couldn’t and shouldn’t look like the installation at Devening’s gallery. Evident in Devening’s gallery was DeGiulio’s self-reflective and questioning approach to art-making, and the “Tomboy” work reflects a self-reflective and contemplative approach to herself. The difference is slight but important, at least for DeGiulio’s creative development. Down the street from Devening’s gallery was the closing of Molly Zuckerman-Hartung’s solo exhibition at Julius Caesar gallery, an artist-run space co-run by the artist. Zuckerman-Hartung also shows regularly at Rowley Kennerk Gallery, a commercial art gallery in Chicago, which made this project seem less official, and more intimate. There were sixty-five container lids, from foodstuffs and art supplies, painted informally, or informe, or formlessly. They were abstract mini tondo paintings and remnants from her daily life. “Flesh of an anemone” is the title of one. Even more unique and revealing about this exhibition was a set of five photo collages showing the artist’s studio, her paint-splattered floors, what she was reading, her bed and the artist Dana DeGiulio on a bed, asleep. Zuckerman-Hartung treated her exhibition at this alternative gallery truly as an alternative, as a peek behind the scenes of her life, of her life as artwork, and revealed another layer of her creative practice. A small drawing by Jim Lutes is tucked within a recession inside the wall at Roots & Culture. In total the Lutes drawing and the small wall cave is an artwork by CJ Matherne, who is an artist and Lutes’ studio assistant. While Matherne’s carpentry skills are shining here (likely from building supports for Lutes), the younger artist is grappling with the influence of the older. The wall recession buries Lutes’ drawing but also enshrines it. Lutes’ artwork is given a second life, and Matherne’s art practice is ennobled.